Fans of indie and art rock, are you ready for the show of a lifetime?? The incredible, award-winning Arcade Fire have a new album just about to come out, and they’re going to take it on a MASSIVE TOUR!! Infinite Content comes to Oracle Arena on Tuesday 17th October 2017 – don’t miss your chance to be there! Get your tickets to this sell-out show while they last – book today!!! The band set a very high standard for themselves with “Funeral,” but it was one they seemed easily able to maintain – their follow-up, “Neon Bible”, released alongside two other iconic albums; The Shins’ “Wincing the Night Away” and Modest Mouse’s “We Were Dead Before the Ship Even Sank”, is credited as being part of the movement that that helped to popularise indie rock. 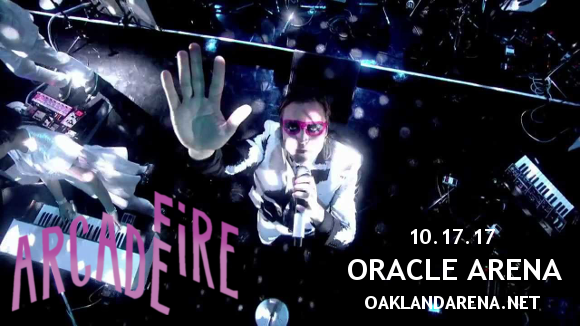 Each and every one of Arcade Fire’s releases has been a masterpiece – are you as excited as we are to hear the next?? Get your tickets to be part of the LIVE experience today!! !